"It's all about the trains"
Starts off at West Bottoms in Kansas City Missouri to see some big Union Pacific trains, then off to Benson in Arizona for more high speed Union Pacific freights, San Diego California where the BNSF (Burlington Northern Santa Fe) Railway is king. Lots of Amtrak California action, including a ride to Fullerton, and a ride in the San Diego Trolley. We finish off at Fullerton California - a great place to watch trains. 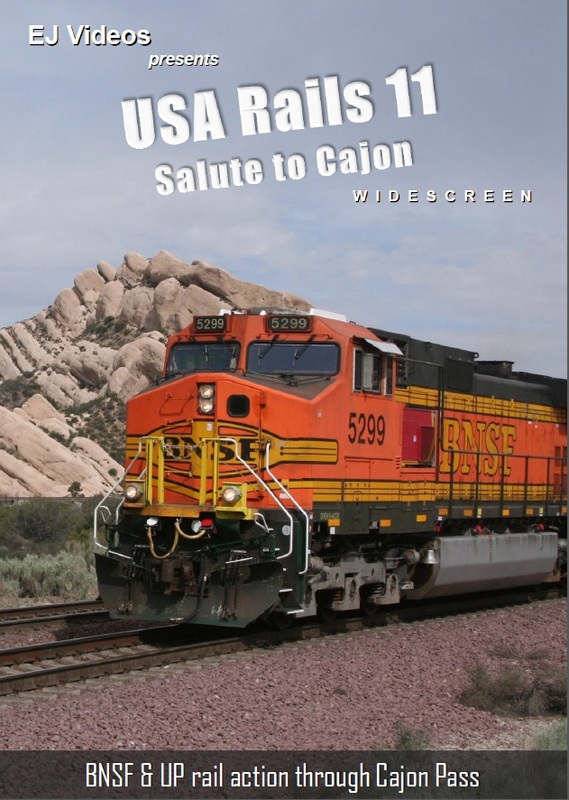 Contains all of the footage from USA Rails 1 plus a whole lot more. Trains are not edited so you get to see the whole thing - but be warned, some of them are very long and slow. This special 2 hour version has no introduction, no narration, more trains from Kansas City, San Diego and Fullerton, and takes a brief look at the San Diego Model Railway Club. A repeat visit to the USA six months later produced enough footage to make another two videos. 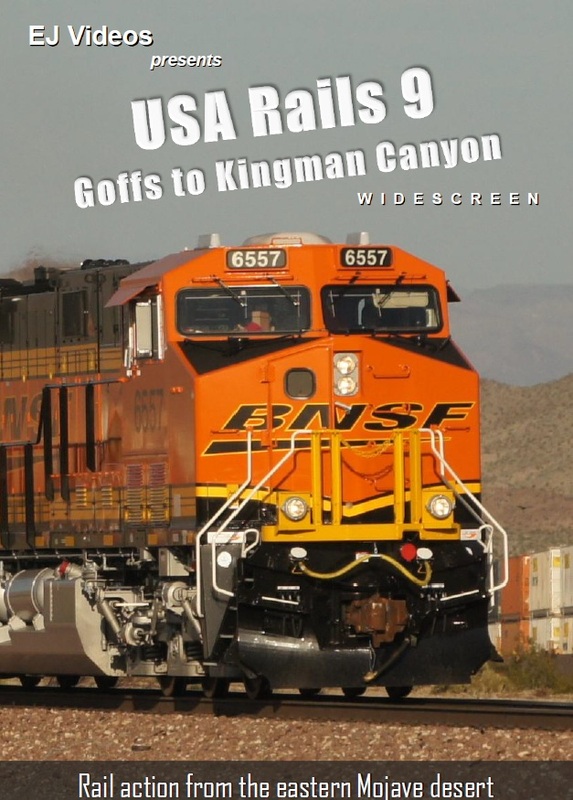 This first one features lots of CSX action from Washington DC and Alexandria Virginia, and more high speed Union Pacific action from Benson Arizona. Lots of Amtrak action - including the USPS Roadrailers. All CSX and Amtrak trains are identified by number, origin and destination. This final installment features a variety of roads from North Kansas City Missouri including Union Pacific, BNSF, Norfolk Southern and Iowa Chicago & Eastern (ICE), where there's lots of manifest freights (mixed freights) and autoracks. 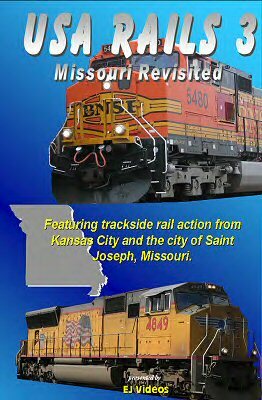 We then head north to check out the intense BNSF action from Saint Joseph Missouri. Lots of very long, high speed coal trains and manifest freights. Hotbox and dragging equipment detectors are caught on tape as well. "If you have a thing for SD70MAC's - get this one." 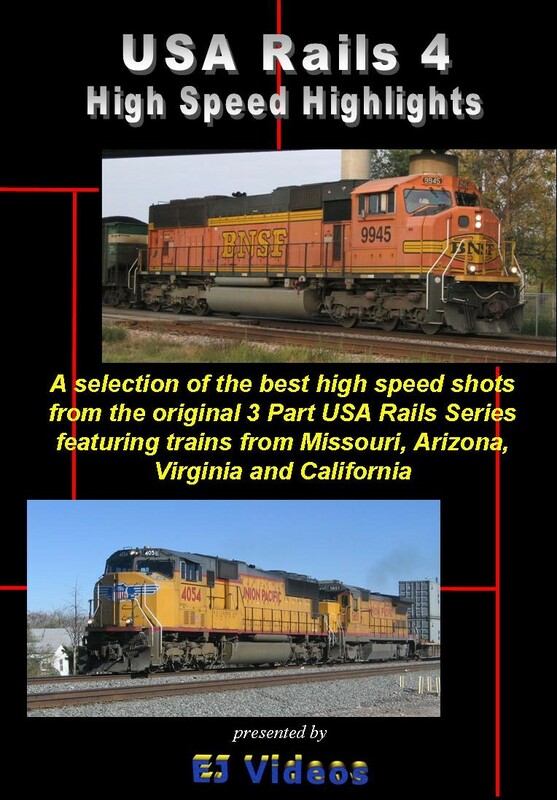 63 minutes of the best shots from the USA Rails series, this compilation features medium to high speed shots from Saint Joseph Missouri, Alexandria Virginia, Benson Arizona, Fullerton California and Kansas City Missouri. This production started out as a personal project that I created to suit my own interests - long trains cracking along at a high pace. 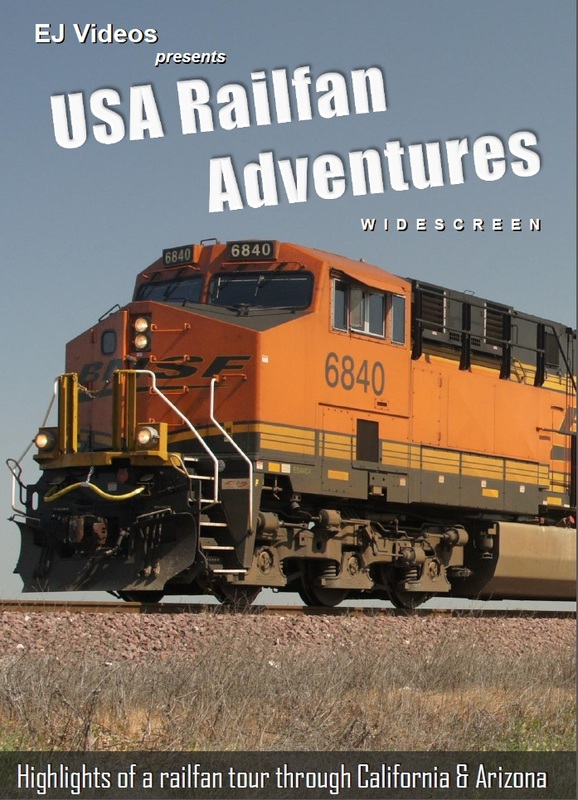 I'm now sharing this with you and has become Part 4 of the USA Rails series. No intro music, just a brief intro narration with minimal subtitles to identify the location. Lots of coal trains, lots of intermodal trains, all going 50 - 80 km/hr with airhorns blasting. If this is what you like, then it comes highly recommended - at the end you'll wonder how one hour went so fast. 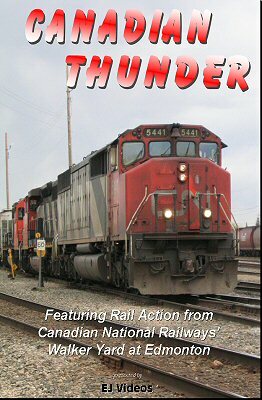 Canadian Thunder covers rail action entering and leaving Canadian National's Walker Yard in Edmonton, Alberta. A huge variety of rolling stock and locomotives. Filmed over 2 weekends, this could easily have been a two hour production owing to the length of the trains, so the final production is heavily edited to keep things interesting. Only the shorter locals / transfers plus three main line trains are shown in their entirety. Contains all the footage from Canadian Thunder plus a whole lot more. If I filmed the whole train, then that's what you get. 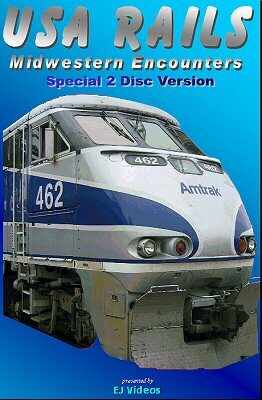 This two hour, two disc version has no introduction, no narration, no identifier subtitles and you get to see the whole train....some of them are very long and slow. 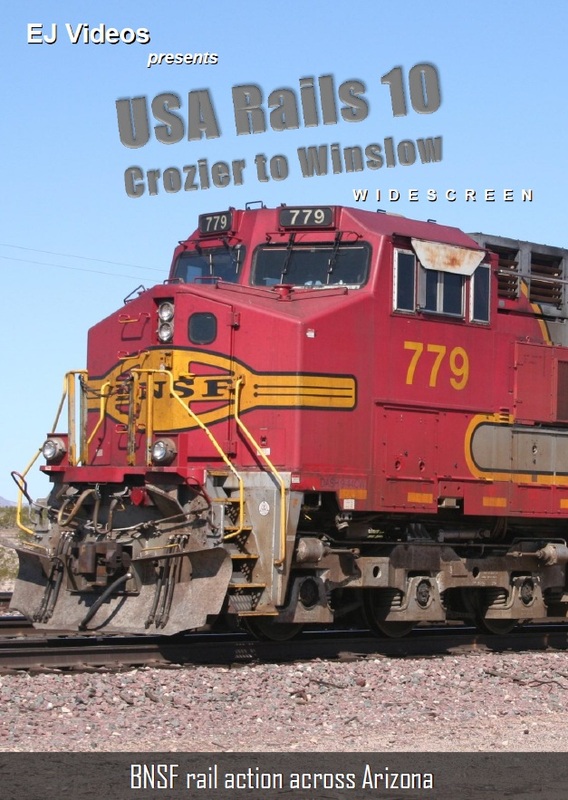 In March and April of 2013, Erin Johnson from EJ Videos and nine other intrepid travellers from New Zealand and Australia took on the USA, spending four weeks on the road in search of as much rail action as they could muster. The journey commenced at San Francisco and embraced many railroading hotspots including Donner Pass, Kingman Canyon, Tehachapi Pass, Cajon Pass, San Bernardino County, Los Angeles and many places along Route 66 in the Mojave Desert. This two hour two disc program provides a glimpse of some of the intense rail action that was witnessed from almost all locations visited and comprises urban, mountain and desert railroading at its best from California and Arizona. No narration, discreet subtitles give location information. "It's been eight years since I visited these shores, check out what a different widescreen and high definition make". This production kicks off at the Caltrain station, South San Francisco, locally known as South City. Here we’re treated to many shots of the Caltrain commuters passing through – some of them stopping, others hurtling through at over 70 mph. Somewhere amongst all this high speed mayhem are the Union Pacific locals, a small number of EMD Geeps stationed on sidings at this station, These burst into life early in the morning and in the late afternoon – right on peak hour commuter time and we’re treated to some local switching. 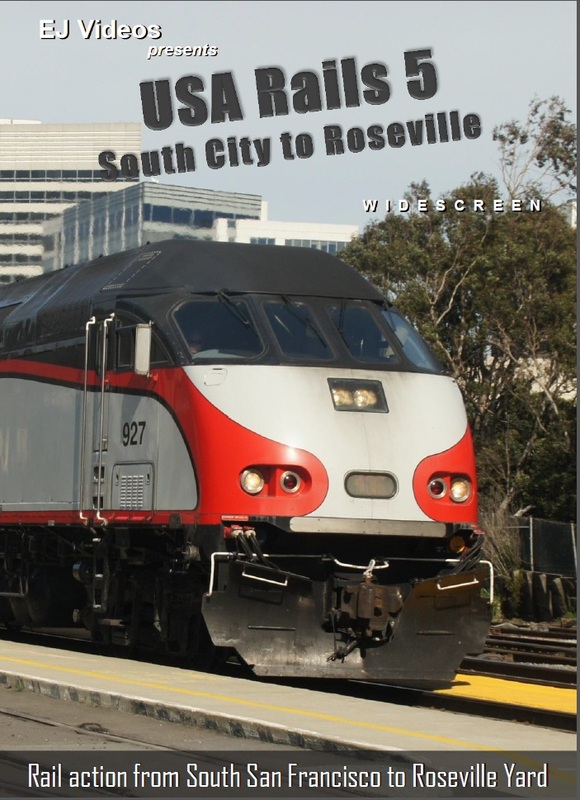 We then head south and pay a short visit to Santa Clara for more commuter action and across the bay to Oakland for a good helping of Amtrak street running in the Jack London District. A brief stop at Emeryville sees Amtrak and BNSF passing through, with further stops at Pinole, Dixon and finally Roseville where we catch the Union Pacific just in time as it heads east out of the yard. We continue our exploration of California by spending a day at Donner Pass where we include shots from the Newcastle tunnel, Alta, Colfax, Truckee and knee deep snow at Soda Springs. We then head south along Highway 99 to Stockton where double tracks cross double tracks, to Escalon and finally Fresno. 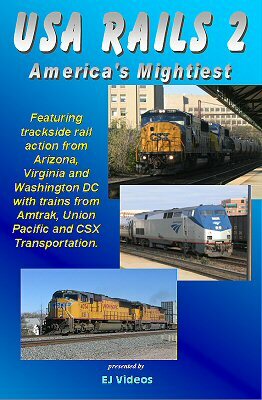 Presented is a good mixture of Union Pacific and BNSF freight action, along with Amtrak and Amtrak California passenger services. 60 minutes of intense rail action. Tunnel 2 just out of Caliente has excellent access and photo opportunities from roadside, whereas the horseshoe curve at Caliente itself has unprecedented views of full length trains, with the added bonus of a passing loop to liven the action up. Further up the hill at Bealville we have another passing loop, as well as a stiff grade that demands every unit of horsepower the engineers can muster from their locos. Beyond the town of Tehachapi the tracks straighten out and level off as they head towards the Mojave Desert, resulting in the expected increase of train speed and we catch some final action at Monolith and Cameron. All of the above locations are amply covered, along with plenty of action from the Tehachapi Loop. The scenery could be described as stunning yet strikingly familiar. 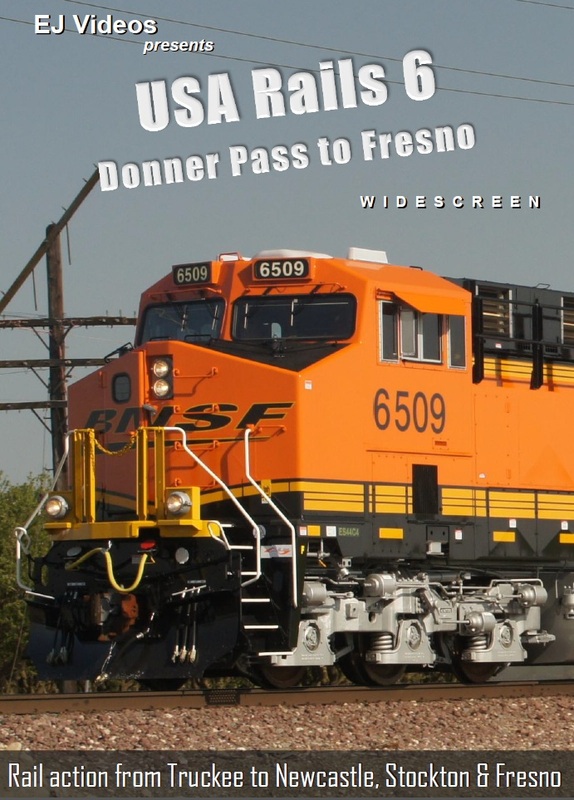 The Union Pacific and BNSF put on a stellar performance. Beyond Barstow Yard lies the Mojave desert – an expansive tract of land that is beautiful as it is treacherous. Driving along Interstate 40 the motorist is treated to a spectacle of mountainous vistas that are made up of many colours. Running almost along side I40 is the BNSF transcon main line, followed closely by the National Trails Highway, formerly known as Route 66. Heading north from Amboy towards Kelso and Cima, the climb takes you to the Mojave National Preserve where Joshua trees are abound in the tens of thousands, humidity is a steady 8 percent and the Union Pacific tackles the grade on its way to Las Vegas and beyond. Somehow vegetation finds a way to survive with Sage Brush and Creosote Plants managing to hang on where humans dare not settle, and yet, amongst all this barren land, the railroads can be seen and heard, all day and night as they tackle the heat and the grades with their all important goods essential to a country’s survival. 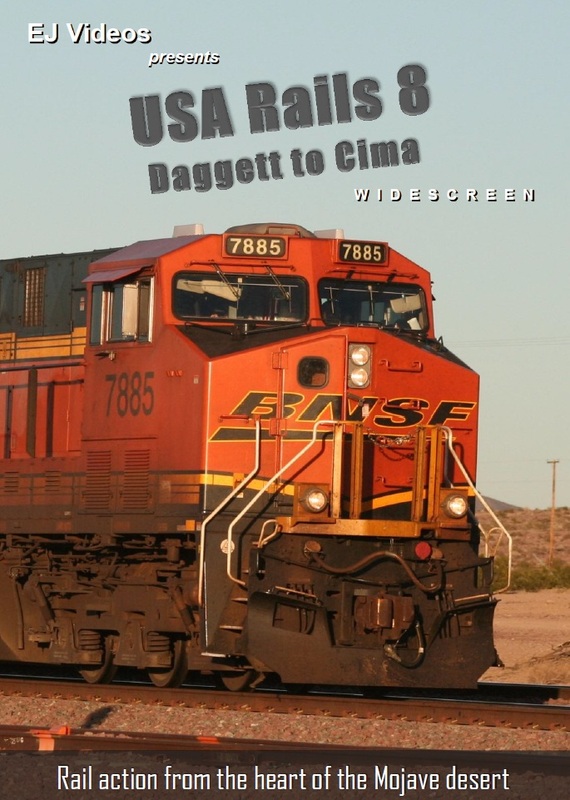 This production covers both high speed main line and switching action from Daggett, Ludlow, Amboy, Ash Hill, Kelso and Cima and represents a typical day in the Mojave desert rail scene. Continuing on our journey across the Mojave desert, we depart Interstate 40 at Fenner and head east towards Arrowhead Junction at Ibis via Goffs. Being at the top of the grade, Ibis provides unobstructed views of approaching trains 5 miles away as they climb up the valley from Needles. South of Needles at Topock, the BNSF crosses the Colorado River from California to Arizona. The manmade landscape at Park Moabi, Topock consists of tailings reminiscent of the extensive gold mining operations that have been on going since the mid 1800’s and continues today. We then stop off at Kingman Canyon, catching both evening and early morning action in this small, but very scenic geographical location. The program rounds off with the all important pacing shot – an extra long BNSF intermodal with a new “C4” loco heading the pack. We catch it as it accelerates past a signal from standstill at Goffs, all the way to Fenner where our final recorded speed was 75 mph. From Route 66 to Interstate 40, we continue our journey across Arizona kicking off just north of Valentine where the BNSF swings into Crozier Canyon. A quick stop at Peach Springs is followed by a generous helping of rail action from Crookton Road, just beyond Seligman. Heading towards Flagstaff, we take on Parks and Sherwood, Cosnino Road, Winona and finally Winslow. We’re also treated to the departure of the Grand Canyon Railway at Williams. The scenery changes from rugged desert at Crozier Canyon, to rolling grasslands at Crookton Road to pine forests at Parks and expansive plains at Winslow. Cajon Pass has long been a magnet for railfans, and no wonder. With four mainline tracks (3 BNSF, 1 UP) offering capacity of up to 150 trains a day, there’s hardly a dull moment. Add to that the excitement of steep mountain railroading (3 percent), ease of access and many photo locations, a day or two spent here is always rewarding. Geographically, Cajon Pass lies in a valley between the San Gabriel and the San Bernardino mountains – right on top of the San Andreas fault. One of the many locations visited in this production, Mormon Rocks, amply displays the upwards action of the fault with their angular protrusion that is in stark contrast to their immediate surroundings. Many of the areas visited are named by railfans: Blue Cut – taken from the blue/grey coloured rocks cut by the railroad during construction; Hill 582 – taken from a signal mast ID plate that once stood below the hill, are two prime examples. Other areas visited are Alray, the Summit of Cajon Pass, Cajon itself and Frost, a suburb of Victorville. West Colton Yard on the outskirts of San Bernardino was built in 1972 by the Southern Pacific Railroad. 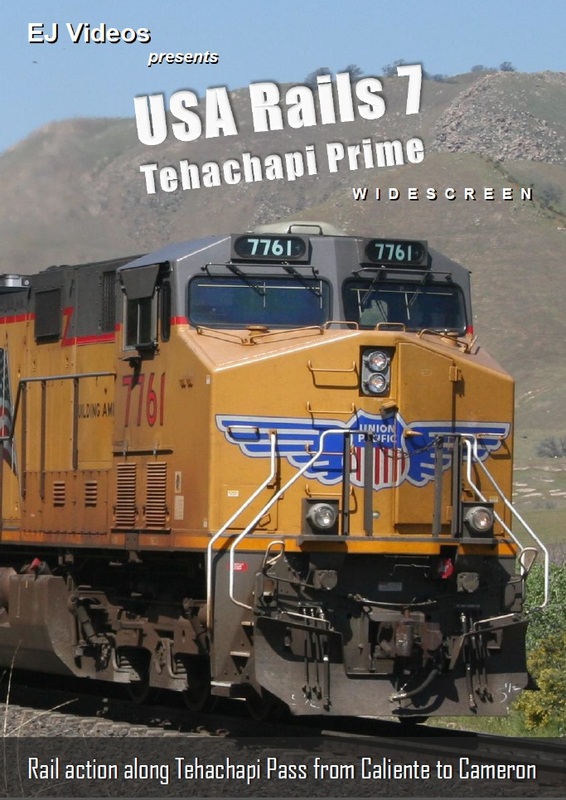 Now operated by the Union Pacific, it consists of 48 classification tracks, 9 departure and 8 reception tracks. Fortunately for the railfan, Pepper Avenue crosses over the yard in full view of the departure tracks, the main lines and the balloon track with unobstructed views of all the action. We catch departures, arrivals and switching, with a constant flurry of activity. 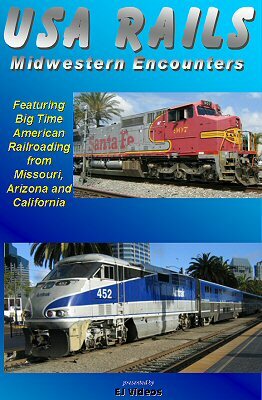 The Fullerton Transportation Center is one of the most well known railfan hotspots in North America and without a doubt, sees some of the most intense rail action available. 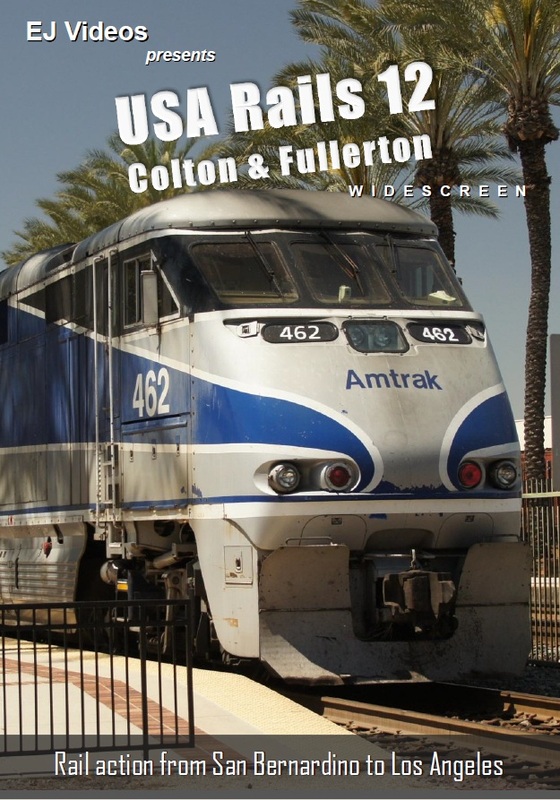 Fullerton lies on the BNSF transcon and shares its tracks with Amtrak, Metrolink and Amtrak California passenger services. A trackside Café and dining area right on the platform with palm trees and no traffic noise provide idyllic surroundings, where the action is all on with hardly a moments peace. See page 2 for more products from North America. Copyright 2011 EJ Videos. All rights reserved.